The Computer Lab has 29 student workstations and 1 teacher/presentation workstation. All PC's run Windows 10 and have Microsoft Office 2016 suite installed. This lab is used to teach all of our Technology classes. It also has one black/white printer as well as one color printer. The Writing Lab, originally designed as a paper and pencil lab, became a part of our technology facilities when the school received a grant. Years later, we still use the lab for research and writing skills. This lab also hosts our health program, which uses an online platform for content delivery. 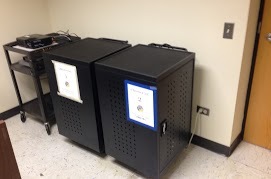 There are 24 Chromebox devices, which are configured for guest access as well so all students can use this lab. PLEASE FOLLOW THE PERIOD NUMBERS DURING SPECIAL SCHEDULES. It will not match the time of day, but this cannot be changed easily. Again, follow the period number. ChromeCarts house our Chromebook collections. Devices are stored in our Tech Central room in the library. Click here to view more about our Chrome program. Please note, there is a priority order for ChromeCart 3. The priority goes to our Junior High Social Studies classes which meet Periods 1, 2, 4, 5. 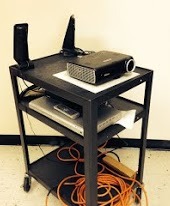 The projector cart is available for checkout. Two slots during the school day and one slot during the weekend. Those who reserve are responsible for making arrangements to obtain the cart, which is stored in the AV Closet in the library. Those without keys, must contact the Building Custodian or Department Supervisor in order to obtain access. Please return the projector and cart to the School Office, Maintenance Office, or Library.